From January 1977 (but published late the previous year): the first issue of Marvel's brief dalliance with the LOGAN'S RUN franchise. The MGM movie tie-in proved short-lived... canned after only seven months on the stands. 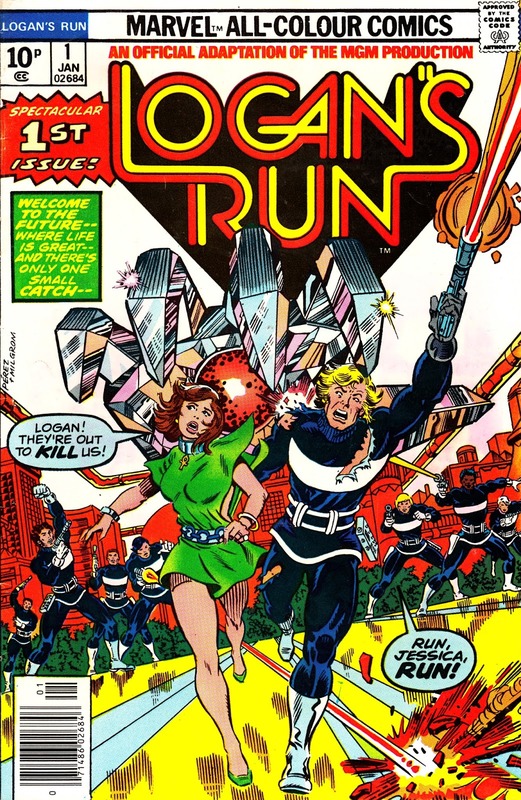 The swift end was apparently down to licensing issues surrounding the creation of new material and the launch of the TV incarnation (the rights to which weren't covered in the Marvel deal... restricting comic strip versions to the British annual and the weekly LOOK-IN strip). Sales probably looked pretty puny once the STAR WARS juggernaut blasted into town a few months later. Marvel UK didn't run these strips, possibly for the self-same licensing reasons, but - as the 10p cover price tells - copies were shipped to the UK as part of the bundle that went to British newsagents. My all time favourite adaption. Some beautiful work by George Perez throughout. The 6th issue is probably the most interesting in that it has the first solo story featuring Thanos, the future big bad of the Marvel cinematic universe.